I have a new Sarasota favorite! YAY! I met my family here for a goodbye dinner as my parents are heading out of town for the summer. Knowing that it’s run by the same people as Libby’s, (another fav) I knew I was in for a treat. I did go with slightly lowered expectations because of a surprising number of poor reviews on Yelp, but I had an open mind having been misled by Yelpers before. Pulling up to the cool building/parking lot/outdoor bar area, It looked like a pretty fancy place by Florida standards. We walked inside to find beautifully tasteful decor. A sleek fountain in the front sets the tone of the ambiance which is minimalist, detail-oriented and chic. It is young, modern and hip feeling, but not in a trendy way. We were seated at a comfortable banquette and looked over our placemat-menus. It has one of the most appealing selections of any restaurant I’ve been to. Even as a non-meat-eater, there were tons of awesome choices and picking one was not an easy task. It was made a little easier when Gabriel agreed to share two different salads as a starter. 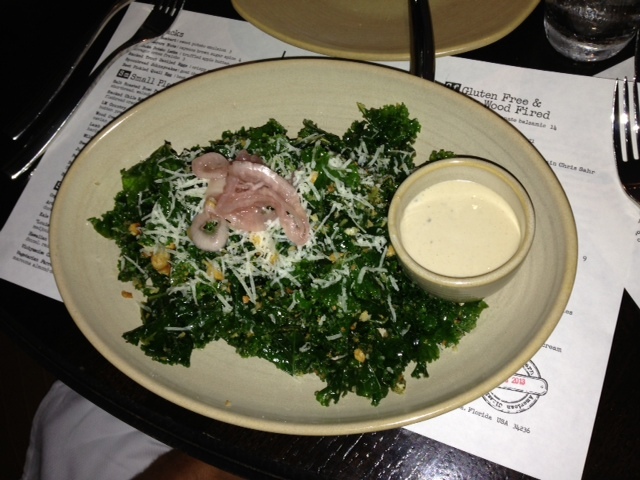 The Kale Caesar was exceptional. I happen to love Kale in any form, but for the many people who don’t, I think this salad would be a great way to try it again. It didn’t even need the dressing that it came with, but once I tasted the creamy, delicious version of this classic, I devoured it even faster. 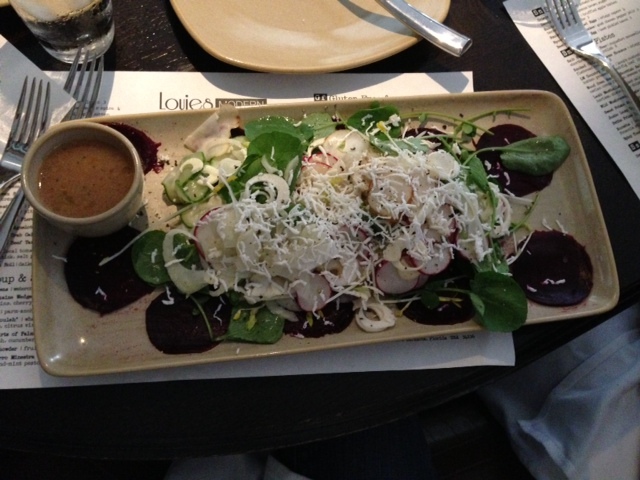 The other salad we ordered was the Hawaiian Hearts of Palm with roasted beets, sunchoke, shaved fennel, radish, cucumber, pressed ricotta, and a fancy aged balsamic. It was light but full of flavor with ingredients that definitely don’t find their way into my at-home salads. Although I preferred the Kale salad, this too was wonderful. Overall, my experience here was way above my expectations. It’s no surprise that even in the ‘off season’ they were crowded and having a reservation proved to be a good (and necessary) idea. I hope that my 5 star review will help the Yelp ratings, which I am happy to report, are WAY off. I will surely be back asap. 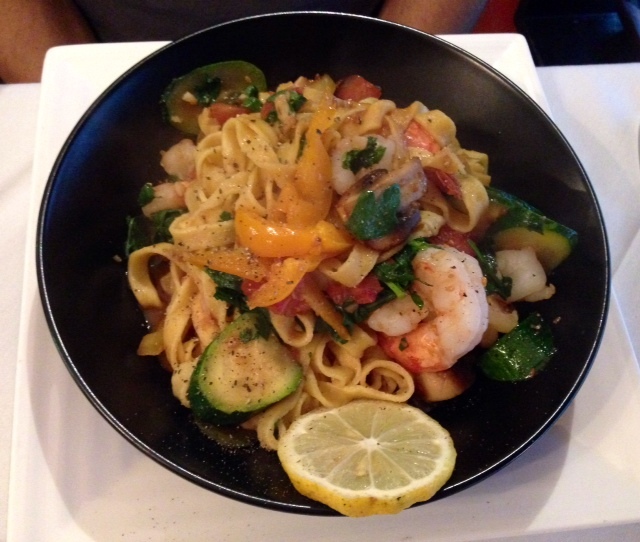 The prices are reasonable for an amazing dinner out, and I honestly loved everything about it. Bravo! After an AMAZING experience of swimming with a wild manatee, Gabriel and I found ourselves starving and in a town we knew nothing about. Our boat captain told us that Crackers is the best place around to grab lunch, so we headed straight there. We walked through the restaurant to be seated out back, and found a huge deck with round tables and umbrellas. It had a tiki bar/casual vibe and there was even the predictable dude-with-guitar playing decent, classic rock, cover tunes. Our waiter took our order and made a few suggestions. We started with the clam strips appetizer- one of my favorite and very rarely indulged-in snacks. 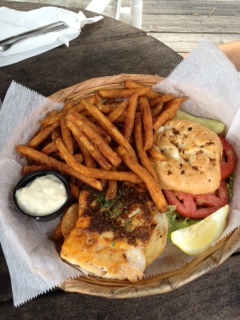 We decided to share the suggested salmon and grouper sandwiches with sides of fries and a salad. The clam strips came out quickly and looked awesome- if not kind of skimpy. They were hot, crunchy and a little bit more breaded than I like, but we polished them off so quickly that we felt a little shorted. The price was more or less fair, but the portion really could have been a bit more generous. The sandwiches and the bread they came on were delicious. The fish was simply prepared and fresh, and the ripe tomatoes and crunchy lettuce were refreshing. The rolls were great for the first few bites, but quickly got soggy beyond holding, and ended up on the plate while we used a fork to finish the fish. 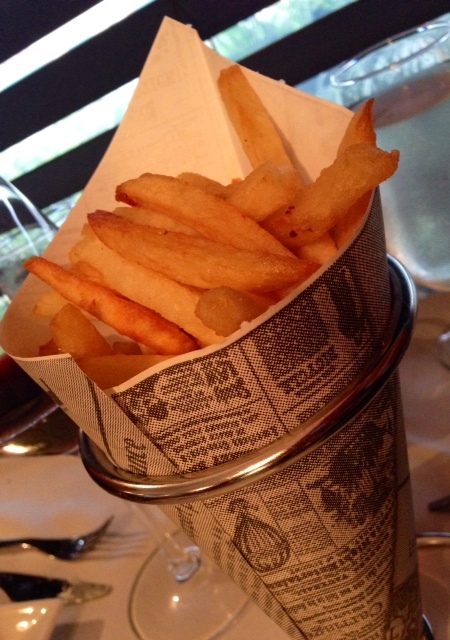 The fries were exactly as requested- extra crunchy and well-done. The salad, made mostly of iceberg and croutons, left a lot to be desired. I find it especially odd when the sandwiches come with a decent lettuce like romaine, and then they skimp with a salad made of iceberg. Overall, the setting was what made this a memorable meal. The food was pretty good- but not really noteworthy. If you’re in the area, it’s a fair choice, but I’d be inclined to explore more if I’m ever back there with some time and hunger on my hands. 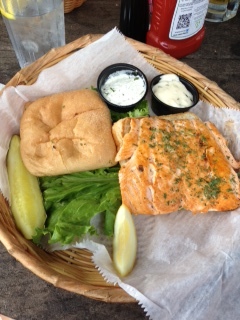 I was excited to finally visit State Street Eating House with my dad for lunch last week. I’ve walked past it a bunch of times and am always intrigued by the menu, the minimalist/industrial atmosphere and the young, hip crowd dines and drinks there. When we met on a Wednesday at 1:30, we were greeted by the owner- who I was sure (and turned out to be wrong) must be from Williamsburg, Brooklyn. It felt so familiar in a New York-y way, and everything about him from his persona to his plaid shirt and bow tie made me think of the Brooklyn hipsters I left behind when I moved to Sarasota last year. We sat at a table and were brought menus and asked if we wanted tap or bottled water. We asked for tap, which we quickly realized was not going to cut it. The water was notably bad, as it often is in Florida, and we ordered a ($6!!) bottle of Evian instead. This turned out to be the ONLY thing about our experience here that we didn’t both love. We did, in fact, chat with the owner about it after our lunch and he was very open to hearing the criticism. He explained that they were expanding into the space next door and planned to add a filtration system. We also discussed his ideas about charging for bread and filtered water, which my father and I cautioned him against. We both agreed that we’d rather see price increases on the menu items to cover his costs there rather than charging extra for things that our society definitely expects to be included. Anyway, back to the meal. We decided to order a bowl of soup, a salad, and a sandwich. We asked the waiter if he would ask the chef if he would split our three choices for us to share. When our food arrived, we were both pleased to see that the splits had been made. The portion sizes were STILL so large that I was surprised it was only ‘half’ on my plate and in my bowl. 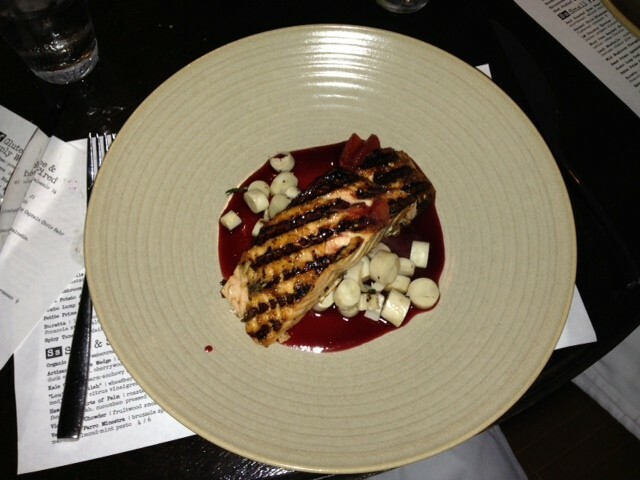 I liked the simplicity of the presentation and felt that it coordinated well with the decor of the restaurant. 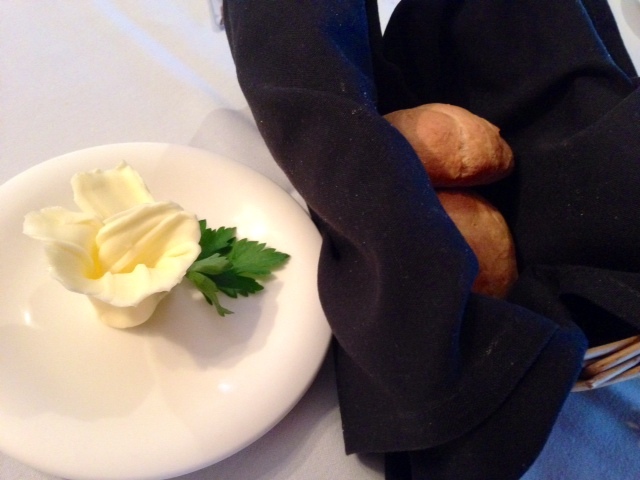 The way the ambiance, menu, staff and food all went together showed clear attention to detail and sophistication. Our clam chowder had whole clams, chunks of potato, celery, little puffed crackers, and a creamy, smooth, not-too-thick base. It had a wonderful flavor that could only come from the fresh clams. 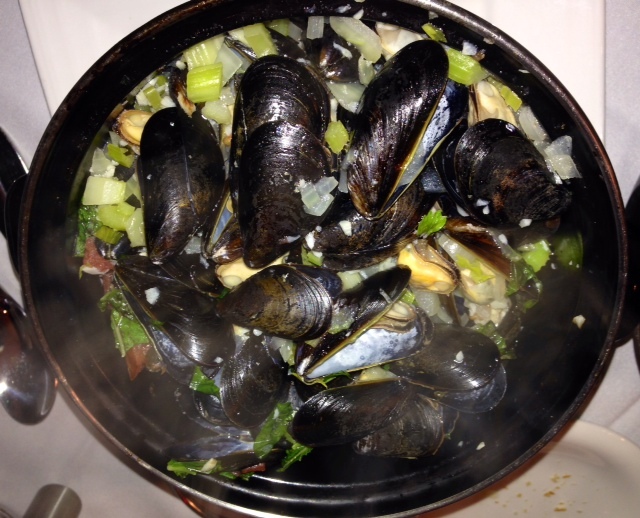 The semi-thin consistency made it a lovely first course instead of the heavy, filling, appetizer that most chowders are. Our salad and sandwich came out next, looking amazing. 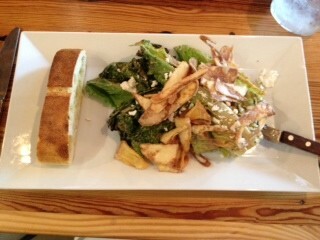 The salad was wonderful; Grilled lettuce hearts topped with ricotta salata and fried hearts of palm. It came with a side of bread, but I chose to leave it behind since the bread on the grilled cheese was already carb-indulgent enough. Well, ok. I did have one little bite of it, but it wasn’t different enough from the sandwich bread that I could justify it. The salad was tossed in a grainy mustard dressing that added texture and a little sharp bite to this creative salad. It was my own fault that I didn’t ask for the dressing on the side. I almost always do, but forgot this time. It was overdressed for my taste, but I still ate every bite and really enjoyed it. 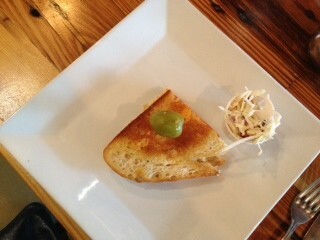 The classic grilled cheese sandwich was served on crusty sourdough, with thin slices of tomato. It was grilled perfectly and adorably topped with a green olive. Some creamy coleslaw came alongside of it, but was also a bit overdressed for my taste. I love cabbage, so too much mayo is always a disappointment. The cheddar cheese was awesome; gooey, sharp and exactly the comfort food I’d expected. Overall, aside from the bad tap water and overpriced bottled water, I thoroughly enjoyed this meal and restaurant. I would love to go back some evening after work for cocktails (they use craft liquors that add to inherently artsy quality) and snacks like the housemade pickles and mini lobster rolls on their snack menu. If you need a cool spot to meet a date or some friends, I think State Street Eating House makes a great choice. I believe I have come up with a TOTAL winner. I LOVE Pad Thai, but the calories and fat in a normal serving make it very hard for me to justify- especially with an upcoming wedding and a commitment to stay on track with Weight Watchers allowances. I’m a BIG fan of PB2 by Bell Plantations http://www.bellplantation.com/. It’s basically powdered peanut butter than you can reconstitute with water. It removes all of the oils and fats and you’re left with very peanut buttery tasting yumminess for very few calories. I have used it in as regular peanut butter, but haven’t really done a lot of cooking or experimenting with it yet, except for mixing it in with frozen bananas to make pb/banana ice cream, or making awesome smoothies with it. I had been looking at recipes on their website for inspiration and after reading a few of their Thai Noodles recipes, decided to take that idea and run with it….and my experiment was a major success. It will definitely be repeated soon. As always, my recipes are just loose guidelines since I don’t really measure anything out…Interpret and adjust it however you’d like. Mix all of that up in a bowl or measuring cup and keep adding hot water in tiny bits until you get to the consistency you want. It should be semi-thick so it will coat the noodles. I can’t stress enough how important it is to rinse either of those noodles before cooking them. Toss everything together and then pour the sauce over the top and mix well. Thinly slice some cucumbers and chop some peanuts to top each dish with and VIOLA! 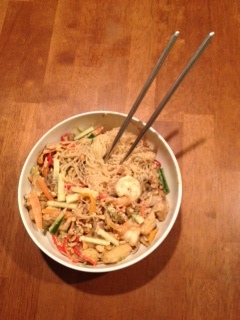 Low fat, low cal, AMAZING tasting Pad Thai. Enjoy! You’re welcome! I was SO excited that my old friend Betsy- who was my restaurant buddy when I lived in NYC, was here for a visit last weekend. Her parents have a condo in Sanibel Island, which is about 3 hours from where Gabriel and I live in Sarasota. We checked Google maps and found that Punta Gorda was about halfway between us and off I went to check Yelp for a place to meet for lunch. We found Jacks on Marion, took a look at their menu online, and thought it would be a great place to try. We met there and were seated immediately. The waitress brought over water and menus and made some suggestions for us. The three of us decided to share the ‘Island Goat Cheese’ appetizer, which is described as; ‘warm macadamia nut crusted, apricot coulis served with flatbread Crostini ‘. It was okay, but not as spectacular as the description made it sound. The macadamia crust really just tasted like deep-fried breading to me. The cheese inside was warm, creamy and gooey. The apricot coulis added a nice sweet touch, but was nothing more than apricot jam as far as I could tell. The bread was fine, but not particularly fresh. It was basically just corners of pita-type bread. 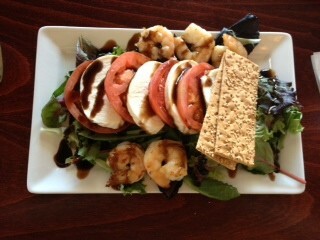 For my entree I ordered the ‘Tomato & Fresh Mozzarella’ and added grilled shrimp to it. It was fairly basic greens with slices of not-very-ripe tomatoes and mozzarella on top. This is clearly not truly ‘fresh’ mozzarella as it had that sort of rubbery/chewy texture. I’ve had homemade mozzarella that melts in your mouth- like the amazing creation from Mozzerella Fella in Sarasota, https://bigforkinmouth.com/2012/09/13/mozzarella-fella-1668-main-st-sarasota-fl/ and I guess it’s pretty much ruined me for any and all store-bought, not-homemade, cheese at this point. The shrimp on the salad were fresh and cooked right, and the balsamic glaze and basil were well-balanced and flavorful, but the salad overall was pretty boring and not particularly creative or high-quality. Saigon Hibachi was another ‘Pho Cali was closed so we looked elsewhere’ kind of discovery for Gabriel and I. We happen to live 2 minutes away, and when we found some good reviews online, we thought it was surely worth a try. What a totally pleasant surprise to find another very good Japanese/Vietnamese restaurant in Sarasota– and this one is easy to get into with normal hours and no wait times! Awesome. We were both rather hungry and decided to order a bunch of things to try. We assumed we’d eat half of everything and take the rest home for lunch or dinner on the following day. What we didn’t expect was to find everything so tasty that we finished it all right then and there. We started with a small salad that came with the Hibachi Special. The salad was the only part of our whole meal that wasn’t impressive. It was just boring iceberg lettuce with some shredded carrots and a couple of slices of cucumber. 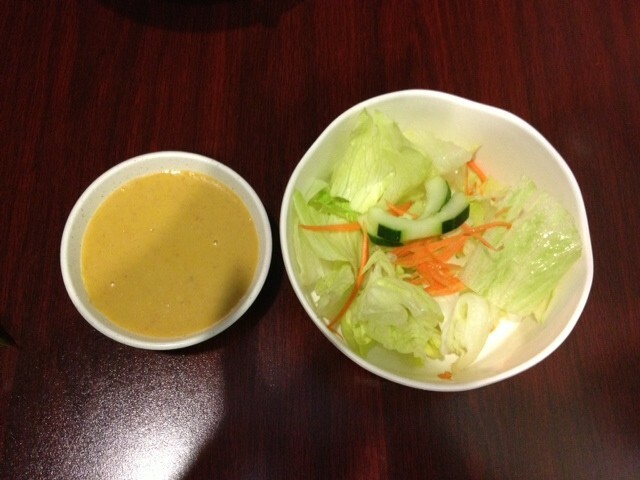 The dressing was very nice and light though- and we ended up holding on to it to use with other parts of our meal. Next, the waitress brought out the fresh cilantro, sprouts, scallions, lime and jalapeno for us to add as we pleased to our Clear Soup with Shrimp. The soup was wonderful. 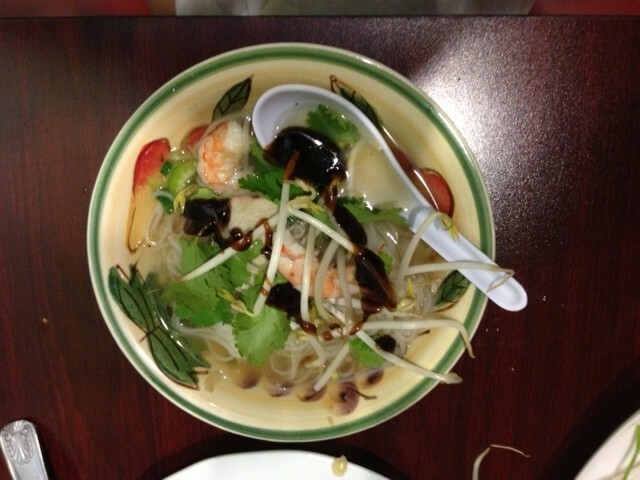 It was flavorful and had beautiful, large shrimp floating in it along with mushrooms and lots of rice noodles. Our Saigon Pancake came out next. It wasn’t quite what we were expecting, but it was also very tasty. 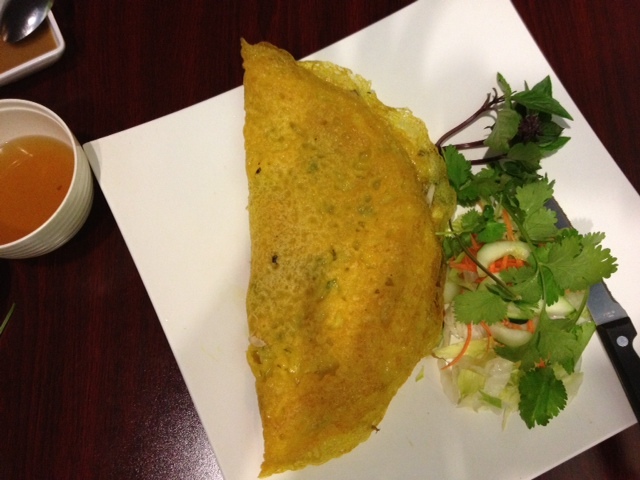 A huge rice flour crepe was stuffed with shrimp, pork, bean sprouts, onions and lettuce. It also came with a delicious dipping sauce, but we found that using each of the different sauces with each bite made it even more interesting. 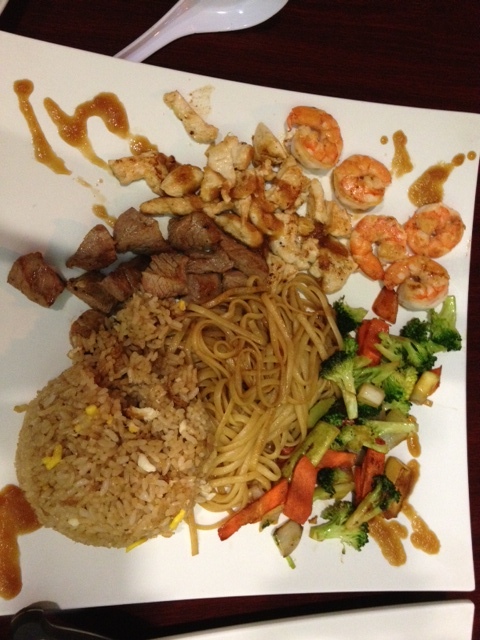 Our Hibachi special came with lots of sides including fried rice, noodles, and mixed vegetables. The chicken, steak and shrimp were all really excellent. All were cooked perfectly and in very generous portions. There were two sauces for dipping. 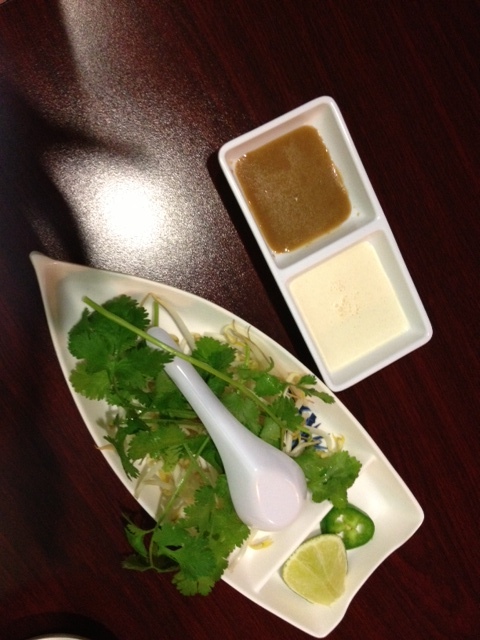 One was a white, creamy sauce called ‘yum yum’ and the other was a more typical ginger Hibachi sauce. Both were delicious and we enjoyed seeing which was better with each item. I personally liked mixing both together. Overall, this was a great ‘stumble-upon’ meal for a very fair price. The amount of food we got (and finished!) was an excellent value and great quality. The service was friendly and fast and the location is super convenient. We will most definitely be back soon!